We promises to deliver cutting-edge mobile app development services in every industry. We have a great team of Mobile app development, Our Developers are agile practitioners for years and have years of working experience in App Development. our developers have grown tremendously to deliver the full range of mobile services. Therefore, they are more productive than other development companies. We work with commitment and we believe in efficiency and Quality. That’s why minimizing risks of product development by releasing early and often. 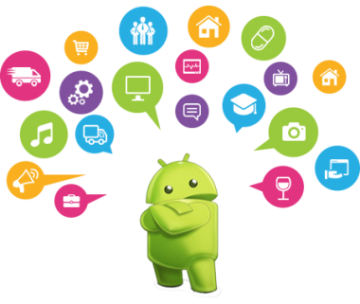 We primarily develop Android Apps while delivering consistent web experiences. While we focus on your development needs, we’ll help you develop a mobile strategy that will take your business idea from conceptualization to a well-loved app on Google Play. Among all the other mobile application development companies, what sets us apart is the end-to-end solution to create a unique mobile experience across multiple platforms, devices with continued support and maintenance to respond to your short-term and long-term needs.